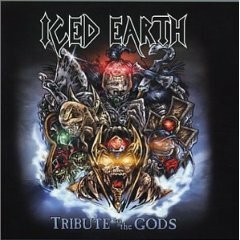 ICED EARTH – “Tribute to the Gods” is a fine Metal tribute indeed. Iced Earth released the Metal cover song album – Tribute to the Gods in 2002. This album packs quite the Metal tribute, to some of the most revered bands in the history of Metal. A sampling of some of the songs covered, with their respective legendary Metal band: Kiss – Creatures of the Night & God of Thunder, Black Sabbath – Black Sabbath, Judas Priest – Screaming for Vengeance, AC/DC – Highway To Hell, Iron Maiden – Hallowed Be Thy Name & Number Of The Beast. There are 11 Metal cover songs in all, with Alice Cooper and Blue Oyster Cult rounding out the tribute list of Metal bands. Jon Schaffer, founding member, plays rhythm, lead and acoustic guitar. 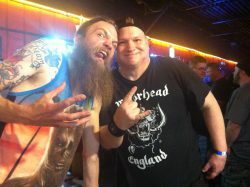 Jon Schaffer is someone I hold in extremely high regard as a musician and song writer. Every song is covered with exceptional Metal brilliance on Tribute to the Gods, the musicianship that is heard here takes nothing away from the original songs. To put it plain and simple, this album is as fine a tribute as you will ever hear for these classic Metal tunes, giving nod of appreciation and a thunderous Metal thanks to all the legendary Metal bands listed earlier. Matthew Barlow on lead vocals is tremendous, I always look to him as the lead singer for Iced Earth. Matthew Barlow has his signature vocals that stand out, he never over reaches on any of these vintage Metal tracks. If you are new to Iced Earth, this is a great starting point for catching up on one of the Metal world’s most underrated bands to ever exist.